Unit studies are such a great way to make learning fun! 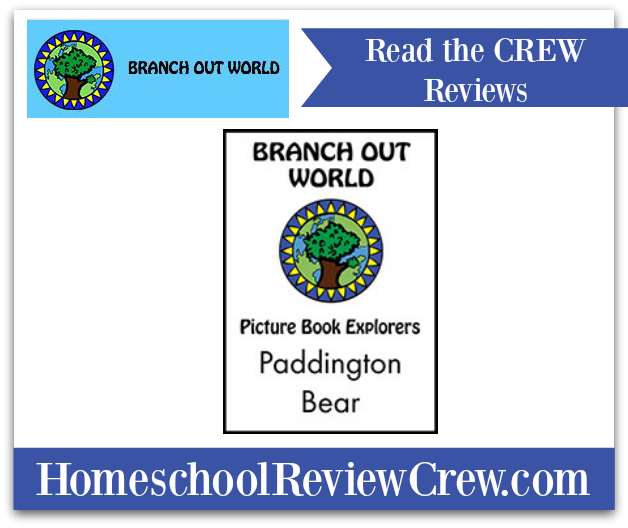 The kids and I have enjoyed using the literature based unit study Paddington Bear, from Branch Out World. Paddington Bear is part of their Picture Book Explorers series, and it really allowed us to dive into many different aspects of the book. I received a digital file with a PDF e-book in it. The book is written in British English, which made it a memorable experience for the kids. We really got to talk about some of the differences between US English and British English. This lead to some “not in the book” discussions and research. The book is 69 pages long. You will also need a copy of the book Paddington Bear by Micheal Bond. I didn’t have the exact copy recommended in the unit study, but I didn’t notice any problems because of that. What’s the Unit Study Like? I really appreciated the concept behind the Picture Book Explorers series. The goal is to pick five days to complete the whole unit. The author recommends consecutive days, but because of summer we didn’t stick to that schedule. Each day, you read the book aloud. This helps your children gain familiarity with the characters, places, and events of the story. Once you’ve read the story, you dive into more learning with hands-on projects and activities. There are several listed for each day, so I picked a couple that I knew would be a good fit for the kids I had participating that day. I’ve never done a unit study broken down like this before, and I really liked it. The format really allowed us to deep dive into a single topic each day and follow any rabbit trails that naturally occurred. There are so many different activities, there’s sure to be something to engage every learner in your family. There are hands-on projects, crafts, science experiments, learning more about art, vocabulary studies, and more. On the first day, we learned more about England and Peru. The setting plays an important part in any story, so it was neat to spend time really studying this. The kids colored flags, located the countries on maps, and learned more about some geographic terms. They colored maps, and added details. On the second day, we learned more about the words in the book. This day we also spent a lot of time talking about different meanings of words, words that we noticed were spelled differently in British English, and the history of spelling changes in American English. One of the projects was to look at vocabulary words in the book. My oldest was participating with us this day, and enjoyed drawing pictures to illustrate the words. The third day was a dive into the illustrations in the book, and really offered a great art lesson. The kids learned about architecture, overlapping designs, and many different art vocabulary words. It was fun to try to recreate some of the effects used in the book, and create some mini-books. One of the science activities my kids really enjoyed was creating foam from hydrogen peroxide and yeast. I wish I’d remembered to take a picture, but I know this is an experiment we’ll do again! There was a ton of scientific information included in the book. I love how in-depth it went. You really can scale this up or down to use with your children, no matter what grade they are in. Some of the older kids really understood the scientific concepts, and the younger ones just enjoyed doing an experiment. There’s also a recipe for edible foam (meringue) that we haven’t had a chance to do yet. That’ll be a lot of fun! There were ideas for foam art (painting in shaving cream, which was another family favorite), having a tea party, and learning more about food in Peru. The math section talked about parallel lines, numbers, and building spatial sense through packing. I really liked exploring Paddington Bear in a new way. It’s a book I’ve read before, but never thought much about. It was a great book to dive into for a fun summer learning project. The e-book is full of information that you can use to provide background knowledge and teach new skills. I really recommend this book, and am looking forward to checking out other books in this series. To see what other families thought of Paddington Bear, please click on the banner below.